Hello! Today I have a Doodle Pantry card to show you that uses images from the set 'Vintage Auto' and papers from the set "Vintage Auto Digi Paper Pack". I absolutely love this set, because it's not only 'vintage' which is a style I always love, but it's a masculine set that isn't hunting or sports related, which is so rare to find. I don't know about you, but I have lots of men in my life who like neither hunting nor sports, and they are the hardest men to make cards for because there just aren't a lot of masculine images out there. Well, Doodle Pantry to the rescue! This set comes not only with this great car image, but also with several different sentiments and digital papers. It's also available pre-colored! To make my card, I used the Splitcoaststampers Sketch (SC350) and two of the digital papers in the set. I colored the image myself, cut it out, and popped it up on dimensionals. The sentiment 'You're a Classic' comes with the set, but I actually typed mine out on the computer because I wanted it straight across in one sentence to fit my layout better. I put the main image panel up on dimensionals also, and then added ribbon and brads for embellishment. Hello and welcome to another Digital Tuesday Challenge. 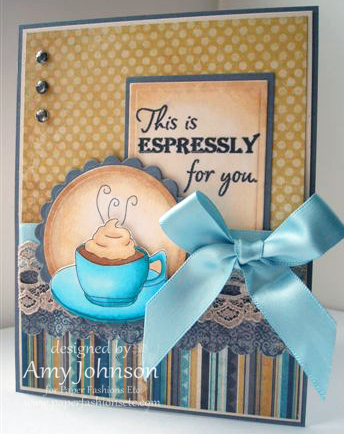 This week's challenge is a Color Challenge: Simply make a card or project with the colors Blue and White. Our sponsor this week is Di's Digital Downloads and they are giving away 5 digis of the winners choice, or 3 stamps of choice. To make my card, I used the Di's Digital Image 'My Turn'. I thought it would go perfect with a Blue and White Color Challenge, although my card is probably more blue/green than a true blue. My layout is by Sweet Sunday Sketches (SSSC114). My paper is Cosmo Cricket, and the sentiment is from Crafty Secrets. I put Stickles on the falling snowflakes, Flowersoft on the snow on the ground, and White Flocking on the bears hat. The snowflake is felt and is from JoAnn's Fabrics and Crafts. Hello! Today I have another cute Doodle Pantry image to show you called 'Quirky Kangaroo'. Like the 'Quirky Ostrich' card I showed you a week ago, I decided to keep this card clean and simple too since the Coordinating Digital Paper and Image were already so busy. This image comes pre-colored, and in out-line form, and also has several sentiments and digital papers to go with it. I used only one of the three papers because I just wanted my kangaroo to look like I paper pieced him, which I didn't. I simply colored him to look like the paper. I then cut him out and popped him up on dimensionals, and just added a simple purple bow for embellishment. Hello! 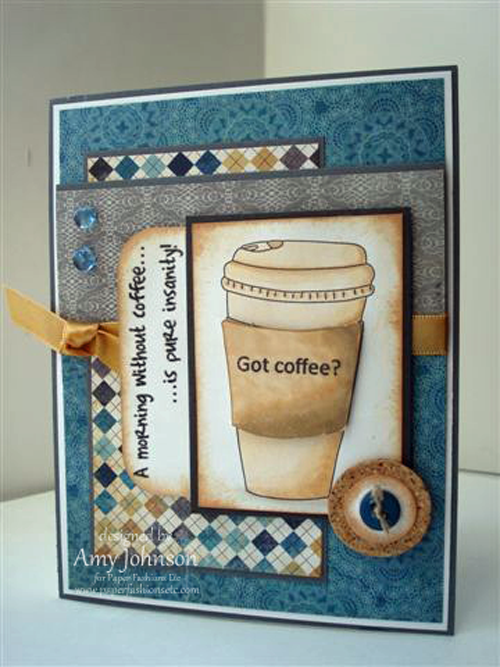 Today I have another Paper Fashions Coffee image to show you! I just love these images because I love Coffee! This card I tried to keep more on the masculine side in case I wanted to send it to a male coffee lover. I printed the image twice, and cut out and popped up just the coffee warmer part up on dimensionals. The main image panel is also popped up. I used cord, dew drops, buttons, and twine for embellishment. The paper is My Mind's Eye Stella Rose "Hattie". 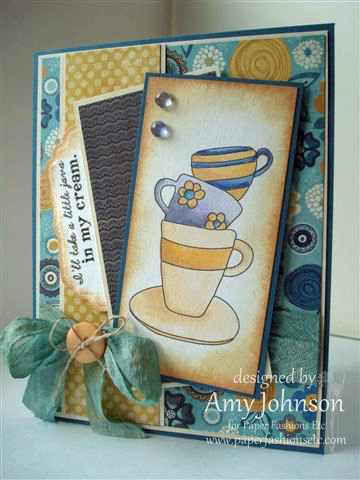 The image is from 'The Perfect Blend' set, and the sentiments are from 'Brewing Some Trouble'. Hello, today I have a clean and simple card to show you. The image is called 'Quirky Ostrich' and is available at Doodle Pantry. It comes in both outline image and pre-colored, and it also includes digital design papers and several different sentiments. This is actually the second card I made using this image. The first card I made I decided not to post. I used all the digi papers on my first card, and I just felt it was way too busy and that it took the attention away from the main image. So then I went back to my desk and kept playing with the image, and finally decided that this image is so great that it could just stand on it's own with nothing but a clean, white background. I colored the image myself, then cut it out and popped it up on dimensionals. I doodled around the edge of the white card stock with a silver glitter pen. Then I added some simple pink pearls for embellishment and some 'Blushing Bride' and 'Basic Grey' Stampin Up! Card stock for an accent color. Sorry for the dark photo, but it's hard to be home at just the right time of day to photograph when I work full-time and the days are shorter. Hello and welcome to another Digital Tuesday Challenge. This week's challenge is 'Celebrate the Season'. Simply make a card or project that celebrates any season of the year or your life. Be sure to include at least one Digital element. Our sponsor this week is Spesch Stamps. To make my card, I used an image by Sylvia of Spesch Stamps called 'Winter Birdie'. My sketch is by Silke Ledlow (CAC80). The main image panel and the little girl are up on dimensionals. I used Flower Soft and Stickles for the snow. I put Liquid Applique on her hat. The snowflakes are buttons from JoAnn's Fabrics and Crafts. The paper is by Cosmo Cricket. Hello! 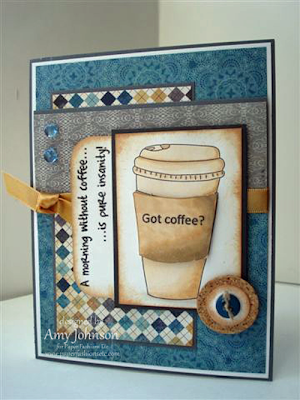 Today I have another Paper Fashions Coffee Card to show you. I just love this new set, because I love coffee. I especially love coffee filled with lots and lots of flavored creamers, so I find this sentiment very amusing. Now that it's fall, all the 'Pumpkin Spice' flavors are in the market right now....yum mm, that's certainly one of my favorites! To make my card I used the same paper I used in my previous coffee card; it's from My Minds Eye and is called Stella Rose 'Hattie'. My sketch is from MFT (MFTWSC34). The main image panel, and the two panels underneath the image are all up on dimensionals. The bow is made with seam binding which I dyed to match my card. The main image is from 'The Perfect Blend', and the sentiment is from "Brewing Some Trouble". Hello! Today I have a new Paper Fashions Set to introduce to you. It's called 'The Perfect Blend' and is filled with the cutest coffee images. I love coffee, especially loaded with my favorite flavored creamers, so this set is right up my alley! To make my card I used a sketch from MFT (MFTWSC33) and papers from My Mind's Eye Stella Rose 'Hattie'. The cup and main image panel are up on dimensionals. The sentiment is from "Coffee with Friends". Hello and welcome to another Digital Tuesday Challenge. This week's challenge is called 'Fairy Wishes'; simply make a card or project that is 'fairy themed' and be sure to include at least one digital element. Our sponsor this week is Mo Manning. To make my card, I used The Stamping Boutique image 'The Fairies Frolic'. I printed the image 3 times. The flowers and mushroom was popped up once, and the fairy was popped up twice. I put Stickles on the flowers, and all the fairy wings and wands. The heart is a button from JoAnn's Fabrics and Crafts. The paper is Prima 'Sweet Fairy'. Here is a close up so you can see the dimension and sparkle better. Hello! As most of my readers already know, I've been posting pictures of my garden as it changes through the garden season. Here are previous posts of pictures of my garden in Midsummer, Early Summer, Late Spring, Mid Spring, and Early Spring. Today's post is all about the Late Summer Garden: Summer's Last Hurrah. This is always such a sad time of year for me as I reflect on the ever so short summer season, and start dreading the cold, winter months ahead. I try so hard not to get depressed about it, but I always do. I just detest winter and anything associated with it. It wouldn't be so bad if it wasn't so darn long, but here in Wisconsin we barely have 3 months of warmth, and then we have 9 months of cold. Ugh! Anyway, enough depressing talk, onto the beauty of the Late Summer Garden. My husband was replacing the third story windows of our house, so I jumped at the opportunity of getting an Aeriel view of our yard without a pane of glass interfering. Here is a shot of of my yard from my bedroom window. What a view to wake up to every morning! As you can see, Yellow is the color most predominant this time of year. That is from all the Black Eyed Susans taking over the show and the Golden Rod. The white is a large Hydrangea Bush, and the purple is what is left of the Phlox, which actually peaked a few weeks ago. This is a view of my yard from the road. The ornamental grass is also in full peak right now. It's a must have for the Late Summer/Early Fall Garden. Here's a close up of the Black Eyed Susans. If you don't have this flower already in your garden, you better run to your garden center and pick some up. Nothing beats this plant in long-bloom time, hardiness, and it's ability to grow fast and spread without becoming too invasive. Here's a close up of my garden shed. You can see the Sedum Autumn Joy in front just beginning to bloom. It'll be in full bloom in a few weeks. A side view of my main garden. Another side view taken as the sun was just starting to set. Here's a close up of another one of my favorite Late Summer Bloomers: Goldenrod! It reseeds everywhere in my garden and I let it! It's considered a weed by some, but a beautiful flower to me! And finally, I debated showing you this photo since I couldn't get a good picture of it, but this is a very tall perennial, over 6 feet tall. It's a must have in a large garden. It's just hard to photograph since it is so tall. The blooms last forever, and it looks great in the winter too. The blooms start pink, and then turn eventually to rust for fall. It also looks great in dried arrangements as well. I hope you enjoyed seeing pictures of my Late Summer Garden. Such a sad, sad time of year for me, yet it's nice seeing my garden go out with a bang!